I recently came across the Optimal Rebalancing Strategy Using Dynamic Programming for Institutional Portfolios by W. Sun, A. Fan, L. Chen, T. Schouwenaars, M. Albota paper that examines the cost of different rebablancing methods. 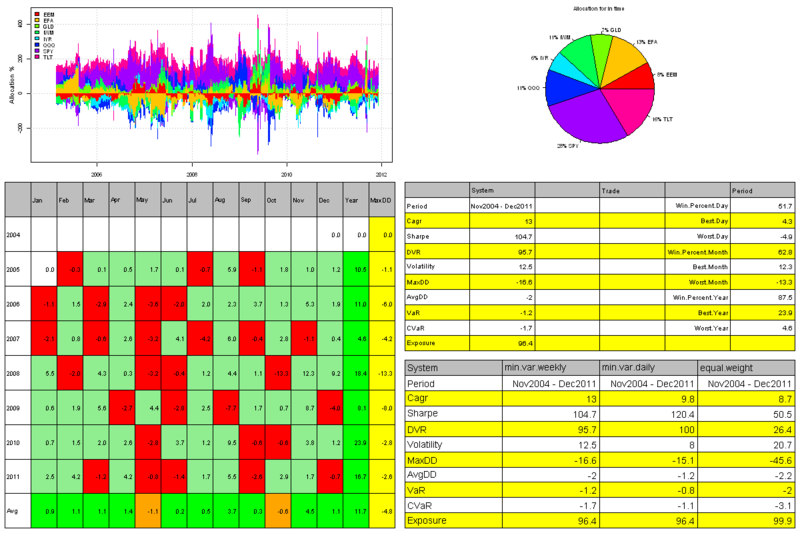 For example, one might use calendar rebalancing: i.e. rebalance every month / quarter / year. Or one might use threshold rebalancing: i.e. rebalance only if asset weights break out from a certain band around the policy mix, say 3%. 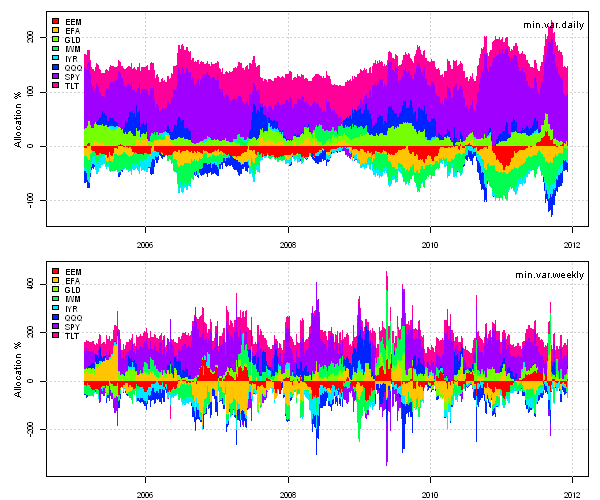 To investigate the cost of the different rebalancing methods, authors run 10,000 simulations. Today, I want to show how to simulate asset price paths given the expected returns and covariances. I will assume that prices follow the Geometric Brownian Motion. 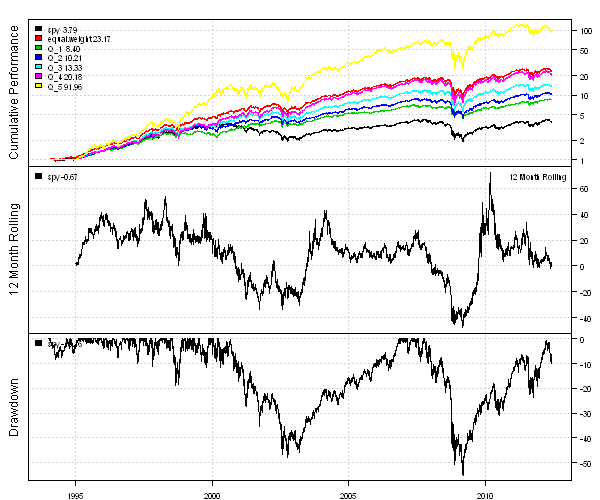 Also I will show a simple application of Monte Carlo option pricing. In the next post I will evaluate the cost of different rebalancing methods. which I implemented in the asset.paths() function. The asset.paths() function is based on the Simulating Multiple Asset Paths in MATLAB code in Matlab. 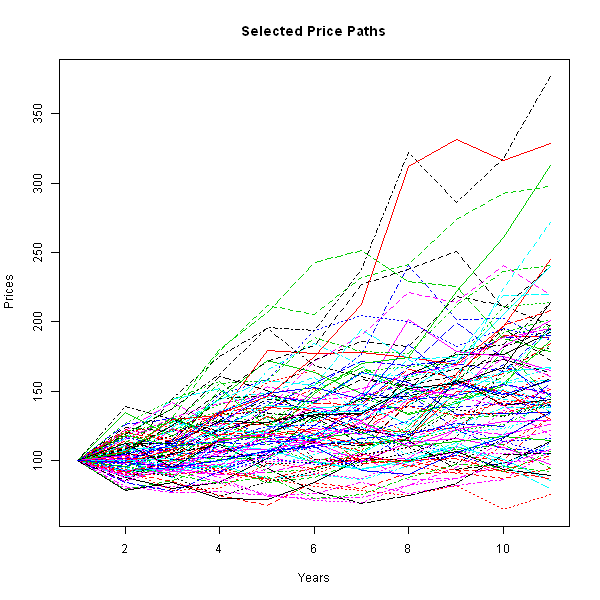 Next, let’s look at examples of Monte Carlo option pricing using asset.paths() function in random.r at github. Please note that Monte Carlo option pricing requireies many simulations to converge to the option price. It takes longer as we increase number of simulations or number of time periods or number of assets. On the positive side, it provides a viable alternative to simulating difficult problems that might not be solved analytically. In the next post I will look at the cost of different rebalancing methods. To view the complete source code for this example, please have a look at the asset.paths.test() function in random.r at github. In the last post, Multiple Factor Model – Building Risk Model, I have shown how to build a multiple factor risk model. In this post I want to explain why do we need a risk model and how it is used during portfolio construction process. Let’s start by loading the multiple factor risk model we saved at the end of the prior post. [If you are missing risk.model.Rdata file, please execute fm.risk.model.test() function first to create and save multiple factor risk model.] 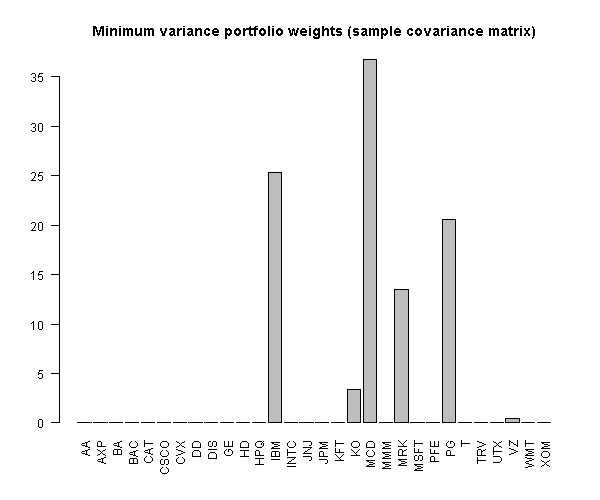 Next, I will construct minimum variance portfolio using the historical covariance matrix. 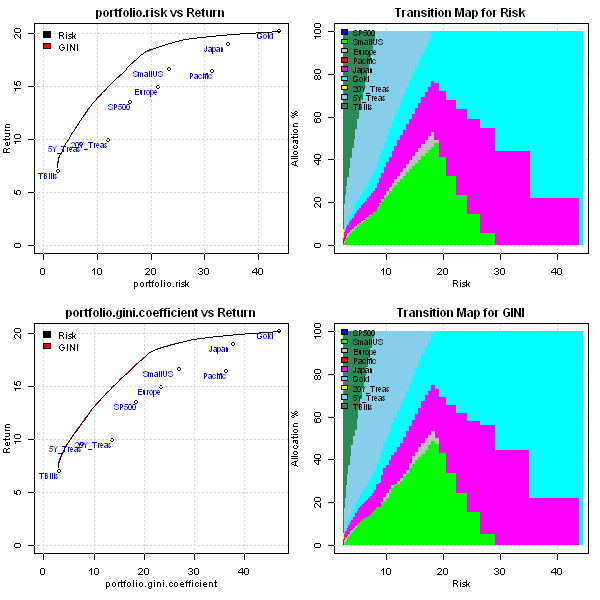 To minimize portfolio risk computed under risk model framework we have to combine specific risk and factor covariance matrix into one covariance matrix. This process is described on pages 4-5 of the Portfolio Optimization with Factors, Scenarios, and Realistic Short Positions by B. Jacobs, K. Levy, and H. Markowitz (2005). Next, I will construct minimum variance portfolio using the the multiple factor risk model we created in the prior post. 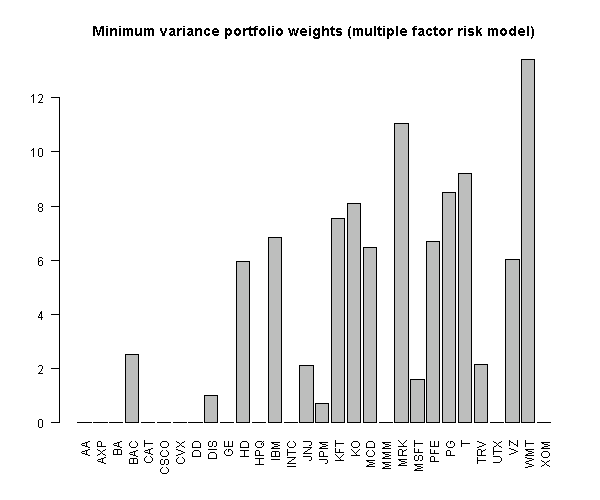 The minimum variance portfolio computed under the risk model is more diversified. Also for a larger stock universe (i.e. 1000-2000 stocks) solving quadratic problem will take less time using a factor risk model that results in a sparse covariance matrix. To view the complete source code for this example, please have a look at the fm.risk.model.test() function in factor.model.test.r at github. 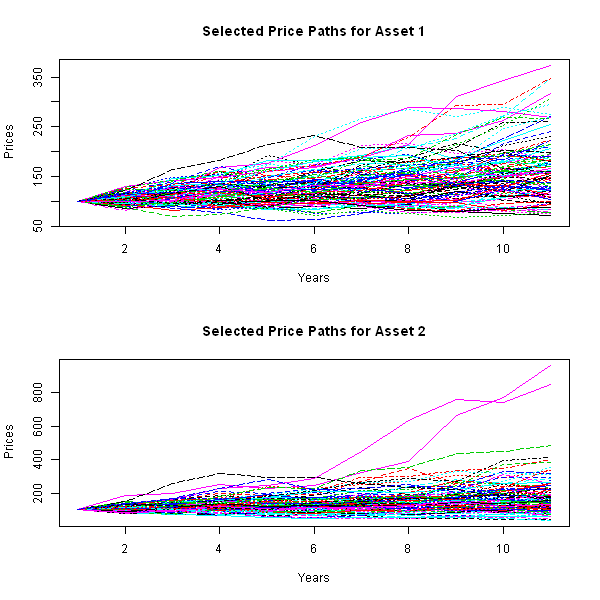 Compute portfolio risk using multiple factor model and compare it to the historical standard deviation of portfolio returns. Let’s start by loading the CSFB factors that we saved at the end of the prior post. [If you are missing data.factors.Rdata file, please execute fm.all.factor.test() function first to create and save CSFB factors.] Next, I will run cross sectional regression to estimate factor returns. Note that we cannot include the first sector dummy variable in the regression, otherwise we will get a linearly dependent relationship of the first sector dummy variable with all other sector dummy variables. The sector effect of the first sector dummy variable is absorbed into the intercept in the regression. 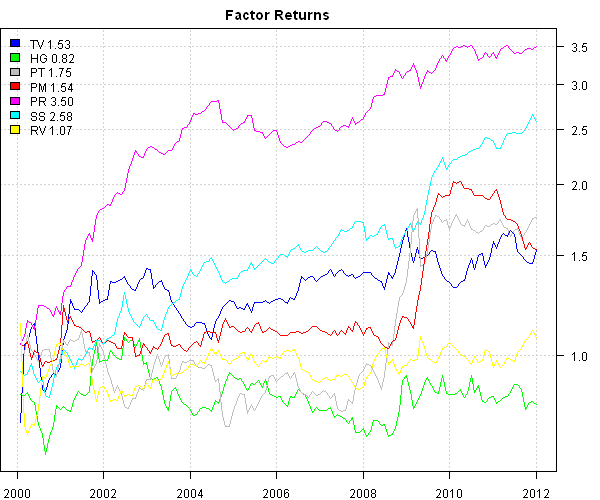 Next let’s look at the cumulative factor returns. 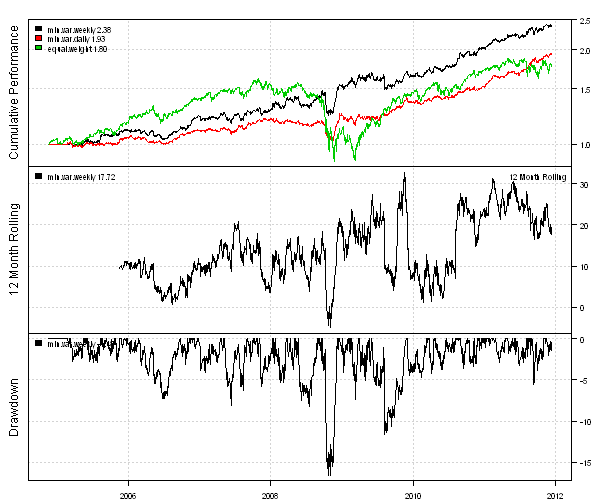 The Price Reversals(PR) and Small Size(SS) factors have done well. 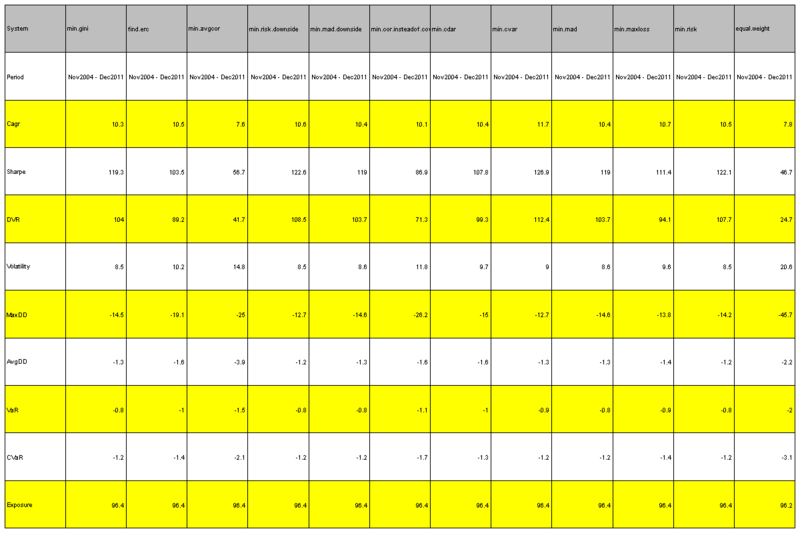 Next let’s estimate the factor covariance matrix over the rolling 24 month window. 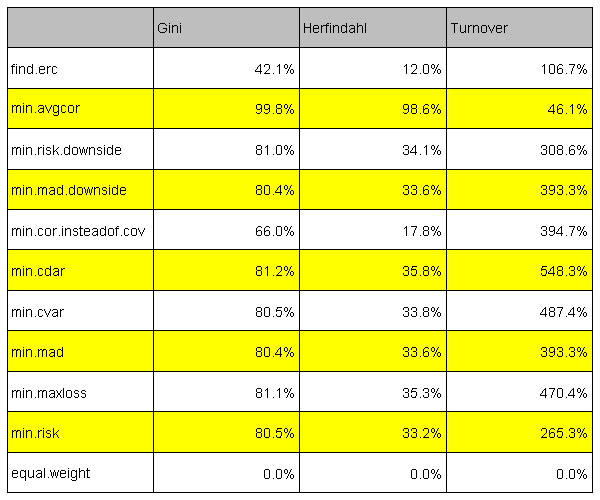 Next let’s forecast stocks specific variances using GARCH(1,1). I will use the GARCH estimation routine described in the Trading using Garch Volatility Forecast post. 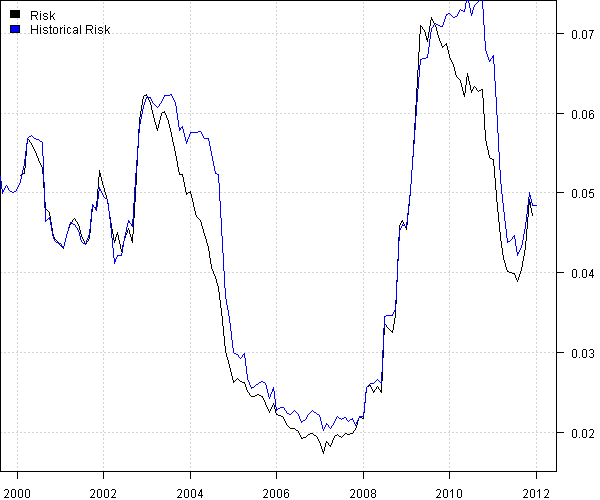 Next let’s compare portfolio risk estimated using multiple factor risk model with portfolio historical risk. 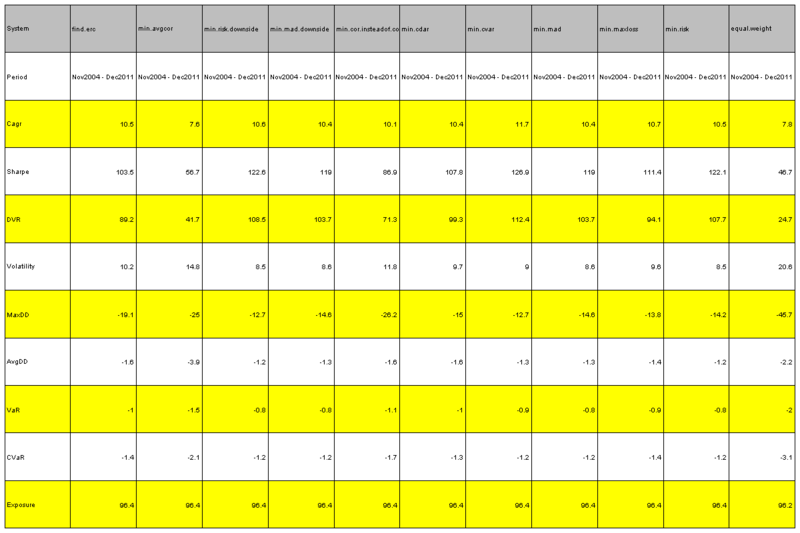 The multiple factor risk model does a decent job of estimating portfolio risk most of the time. 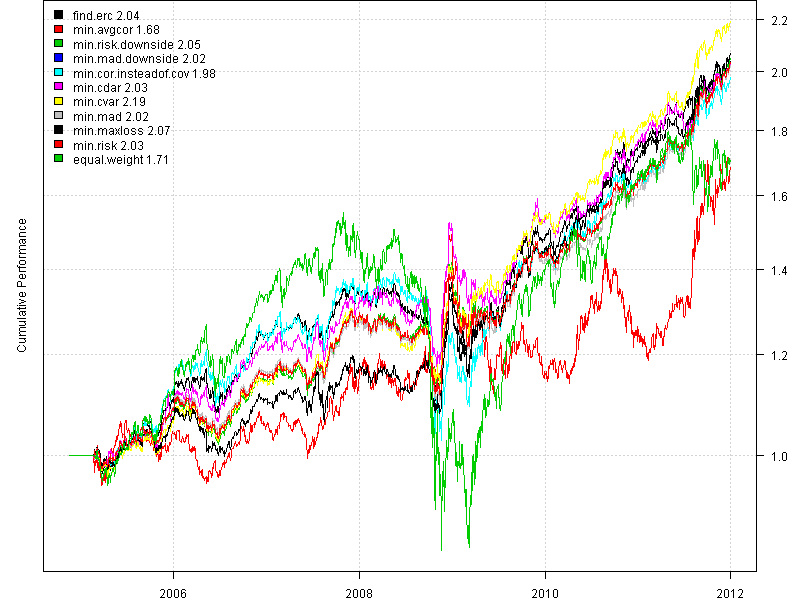 I want to show how to combine various risk measures I discussed while writing the series of posts about Asset Allocation with backtesting library in the Systematic Investor Toolbox. I will use Minimum Variance portfolio as an example for this post. I recommend reading a good discussion about Minimum Variance portfolios at Minimum Variance Sector Rotation post by Quantivity. 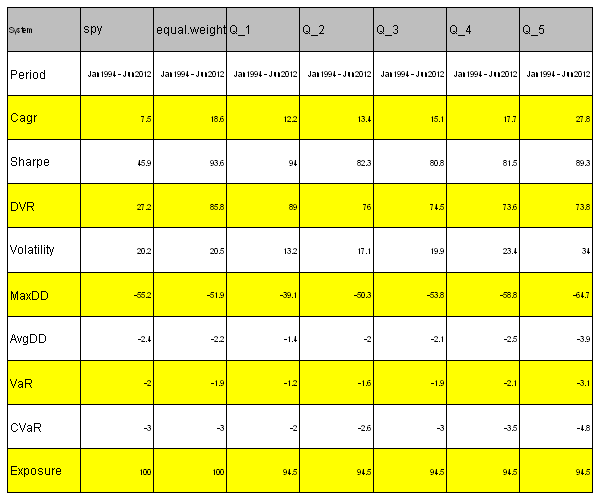 The rebalancing is done on a weekly basis and quarterly data is used to estimate input assumptions. I find it very interesting that the Minimum Variance portfolios constructed using daily returns to create input assumptions are way different from the Minimum Variance portfolios constructed using weekly returns to create input assumptions. One possible explanation for this discrepancy was examined by Pat Burns in the The volatility mystery continues post. To view the complete source code for this example, please have a look at the bt.min.var.test() function in bt.test.r at github.